In the comprehensive owners manual that comes with any speaker purchased from Aperion Audio, the company outlines "The Joy of Buying Direct," which, aside from the promise of attractive, well-made equipment, emphasizes how the consumer can save money. Aperion claims that bypassing a bricks-and-mortar retailer can reduce the price of a speaker by 50%, along with avoiding sales tax. They even offer free shipping both ways, should you need it. Of course, conventional wisdom says that no one should buy a speaker without hearing it first. So to account for this, Aperion offers the usual 30-day home trial (only 2% of orders are returned, they claim), and backs it up with a proactive customer-service philosophy that any other factory-direct manufacturer would find difficult to match. Once an order is placed, you are welcomed by a series of e-mails that introduce you to the Aperion "family." Speakers are warranted for ten years, the amplifiers in powered speakers for three; and within the first 12 months of ownership, you can upgrade by taking advantage of a full-credit refund applied to the cost of your next purchase. The Intimus 533-Ts ("T" for tower, $750 USD per pair) arrived in two huge double boxes, along with a more modestly sized S8-APR subwoofer ($399). The boxes themselves were so impressive that my UPS driver wanted to know why he wasnt invited to the party. As I unstrapped the outer boxes and opened the inner ones, there was one more level of refinement to enjoy on the way to the speakers: in the sort of touch one might expect from items costing much more, each came enclosed in a bag of royal blue velvet. Aperion is a company of the modern era, and as such tends to focus their thinking on home theater. At heart, however, they are music lovers, and pride themselves in serving the needs of music listeners as well (as if the two must be mutually exclusive). The 38-pound Intimus 533-T is 38.5" high, 6.25" wide, 8" deep, and stands on a base 9.25" wide and 10.75" deep. It has been designed to compete with stand-mounted models, and maintains a remarkably thin and unassuming profile atop that relatively small footprint. Music comes from a 1" silk-dome, ferrofluid-cooled tweeter and two 5.25" mineral-filled, polypropylene-cone woofers. Ported in front and magnetically shielded, the 533-T takes advantage of what has come to be known as a 2.5-way design, in which the driver below the tweeter handles the midrange, but both of the larger drivers are responsible for the bass. The thinking is that a smaller cone area in the midrange will provide better integration with the tweeter (while the two larger drivers will be able to supply adequate bass), in addition to offering the soundstaging of monitors. The cabinets are made of 1"-thick HDF and finished in real-wood cherry veneer or high-gloss piano black. The black samples I was sent seemed even sturdier than the speakers of wood and vinyl veneer I usually have in my living room. Aperion supplies heavy brass footers that can be screwed into predrilled holes on the bottom of each speaker, but mine stood directly on my apartments hardwood floors. I auditioned the Intimus 533-Ts with their grilles on as well as off. Typically, I prefer the studio-style vibe of listening to speakers with the grilles removed, but found that while the grilleless 533-Ts were no more revealing, the grilled version was just a bit more forgiving in the upper frequencies. The 533-Ts replaced Axiom M22 speakers in my system, which uses an Oppo DV-970HD universal player as its source, linked by Monster Cable interconnects to an NAD C325BEE integrated amplifier. The Aperions were hooked up to the NAD with 9 runs of Element Cables Double Run speaker cable, whose banana plugs slid securely into the 533-Ts five-way binding posts. Aperion assumes that their main speakers will be paired with a subwoofer. They dont insist on it, but they expect their customers to be assembling 5.1-channel home-theater systems -- 2.1 at the very least. At first, however, I tried out my pair of 533-Ts on their own. Richard Thompsons Live from Austin, TX [CD, New West 6074], the audio-only version of a concert recorded for PBSs Austin City Limits, is as dynamic and atmospheric a recording as Ive heard in some time, thanks to the mesmerizing interplay between the master guitarist and his longtime double-bassist, Danny Thompson. Whether Danny T. was walking it on the opening "Cooksferry Queen," or moving up and down the neck and exploring every nuanced note in between on "Mingus Eyes," the 533-T handled his bass lines with impact, punch, and a liveliness that could be attributed only to the speakers inclination toward crispness and clean music making, while Richard T.s resonant baritone was laced with menace and desperation. When the Intimus 533-T dealt with the microdynamics of the Thompson CD, what came across was a complete absence of coloration -- this was a speaker that, despite its being a floorstander, screamed neutrality. I wanted to test this impression with something a bit less subtle. Govt Mule recorded The Deepest End: Live in Concert [CD, ATO 21517] at the 2003 Jazz & Heritage Festival in New Orleans with a rotating cast of bassists, all paying tribute to the bands late bass player, Allen Woody. On "Bad Little Doggie," lead guitarist and vocalist Warren Haynes sang with a vivid immediacy that projected his voice forward of the speakers and out into the room. I was looking for a bit more bottom-end heft from drummer Matt Abts kit on "Soulshine," however, even though Haynes ringing, striving guitar jumped from the speakers and nearly pulled me out of the chair. I thought the sound lacked some connectivity from one end of the aural spectrum to the other. Enter the Intimus S8-APR powered subwoofer, an economically sized box that differs from the S8 sub by adding two passive 8" radiators to the S8s single active 8" driver. Passive radiators instead of a port permit a smaller cabinet size, which might help the S8-APR fit more easily into smaller rooms. Rated at 100W, the S8-APR offers connection directly to the integrated amplifier or receiver via RCA cables, or a more complex system of two sets of speaker cables: one set from amp to sub, and one out from the sub to the speakers. I chose the simpler route and went directly from amp to sub. With other brands, this shortcut might result in less predictable integration among the sub and the two main speakers, but the integration of the three Aperions was impressively seamless, as if the S8-APR was essential to tying the sound together, like the laces of a whalebone corset. It all came together on Govt Mules cover of "32/20 Blues," Robert Johnsons song really just a starting point for Haynes and guest slide guitarist Sonny Landreth. Over the course of 12 minutes, the 533-Ts conveyed focused intimacy, impact, and punch, while remaining tuneful and with excellent pitch articulation. "Beautifully Broken" and several of the other ballads were supremely uncolored and open in the midrange, and the treble was pristine, stopping just shy of graininess or etch. MeShell Ndeg�Ocello proved she was a monster bassist on her 1993 debut, Plantation Lullabies [CD, Maverick 45333]. The S8-APR let the bass on "Dred Loc" and "Outside Your Door" coat the room like motor oil spilled across a garage floor. Larger subs seem to require tweaking of volume or crossover point from album to album, or even from song to song. Not the Aperion S8-APR. Once set, it offered just the right amount of low end without getting overbearing or congesting the other notes in play. When faced with more upbeat tempos, such as Ndeg�Ocellos "If Thats Your Boyfriend (He Wasnt Last Night)" or "Step Into the Projects," the Aperion system was bold, assertive, and satisfying. An ongoing audiophile debate concerns neutrality and accuracy vs. coloration, or sonic choices made and imposed by the designers of hi-fi gear. Ive come to love my Axiom M22s. They sound rich and suave, and offer a midrange creaminess usually found only in much more expensive speakers. They could also be considered somewhat polite and reserved: laid-back at the expense of dynamic output. By themselves, the Aperion Intimus 533-Ts resolved low-level detail with extraordinary skill, played loudly without strain, and excelled at spatial presentation, thanks to their ability to throw a wide, deep, tall soundstage -- taller, at any rate, than what I can get from the M22s, which are at a natural disadvantage without stands. The 533-Ts imaging was palpable, atomically accurate, tight, and set in relief against the surrounding air. When I added the S8-APR subwoofer, the resulting 2.1 system retained all its transparency while benefiting from a warmly and gracefully extended bottom octave. Its a matter of taste whether you respond to coloration or neutrality, but head to head, the Axiom M22s present a richer midrange and a slightly deeper bass, while the Aperions were a bit more detailed in the highs, resolved inner detail to a greater degree, and imparted an increased amount of musical information. Aperion Audios website is the state of the art, offering education on a wide range of audio topics and the option of dragging and dropping speakers into a virtual room, as well as sharing customer feedback that can help move the decision-making process along. Aperions business model lets you audition and enjoy their products, relatively risk-free, in their natural environment: your home. In-store listening is fast becoming a thing of the past. Theres an old adage among audiophiles: the better a speakers appearance, the worse it will sound. If this is true, then Aperions Intimus 533-T and S8-APR are not audiophile speakers. 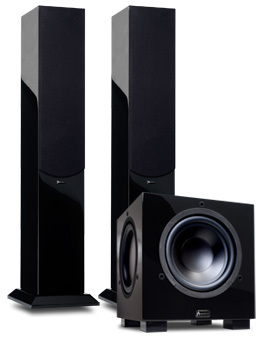 They are attractive and unassuming enough to match any d�cor (or meet any significant others approval), and handle the complexity of music and the dynamic range of DVDs with equal aplomb. Their uncolored sound and talent for imaging are rarely found at this price. Their designers, while paying equal attention to musical truth and aesthetic beauty, have managed to deliver high quality and superior value in one package.